Online advertising is a highly competitive and innovative market being driven to new levels by the rise of ad exchanges, real-time bidding alongside traditional ad networks. With advertisers increasingly buying one impression at a time, advertising market growth is soaring. If your database is the bottleneck limiting the growth of your advertising business, this is the white paper for you. Find out how Clustrix will give you access to functionality, such as ad segmentation and targeting based on up-to-the minute campaign performance, as well as instant access to smart data, so your clients can make the right buy decisions. 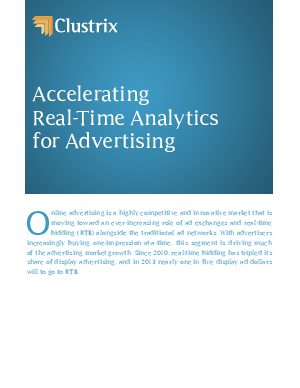 This free whitepaper considers the technical challenges this rise presents for the database, and discusses the unique technology that enables Clustrix to solve these challenges and give your advertising business a competitive advantage.